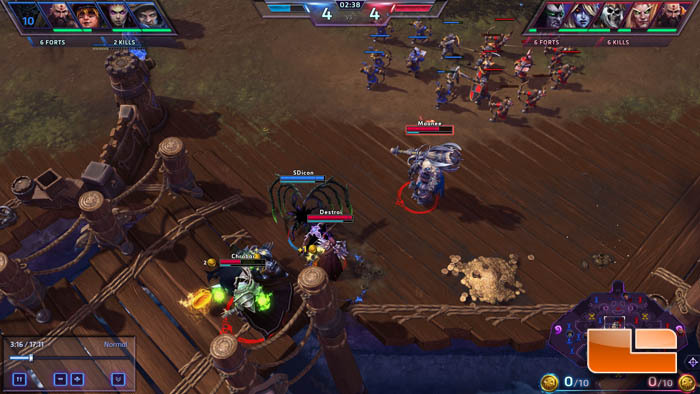 Heroes of the Storm is a team brawler game developed by Blizzard Entertainment and released earlier this year on June 2, 2015. Its genre is ascribed as such by its developer to reflect the radically different game design compared to other MOBA games. Heroes of the Storm retains the primary objective found in other MOBAs: destroy the Core building in the opposing team’s base to claim victory. However, many game elements are simplified to appeal to new and casual players. Heroes of the Storm is built from the same game engine used for StarCraft II which was released back in 2010. 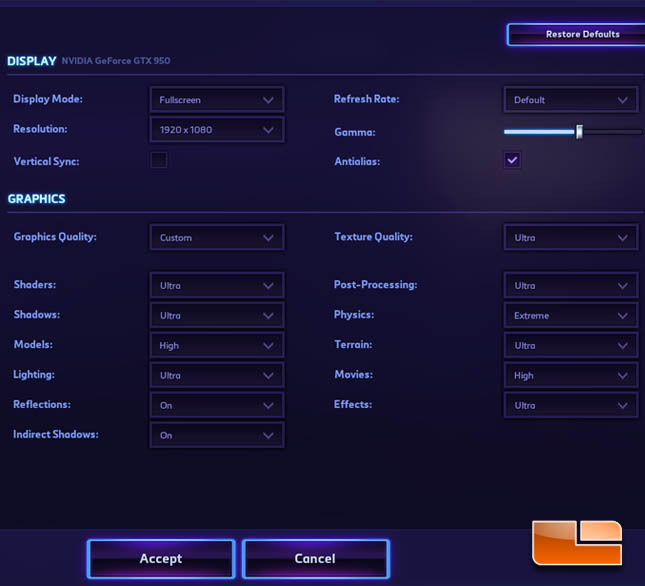 As a result, Heroes of the Storm doesn’t have demanding system requirements. We used the game’s built-in replay feature to benchmark an action packed sequence. 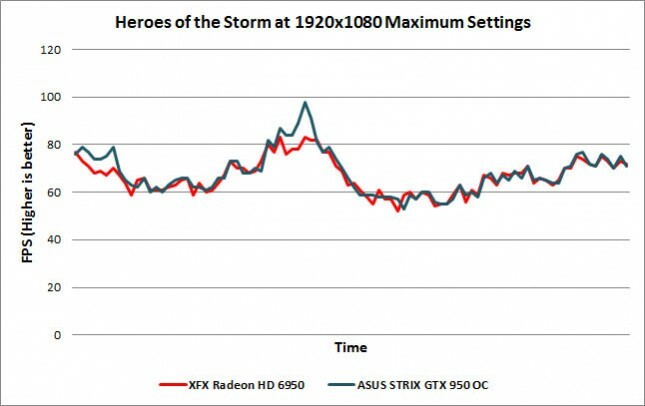 Benchmark Results: The ASUS STRIX GTX 950 DirectCU II OC 2GB video card and the XFX Radeon HD 6950 1GB had very close graphics performance running our Heroes of the Storm replay. 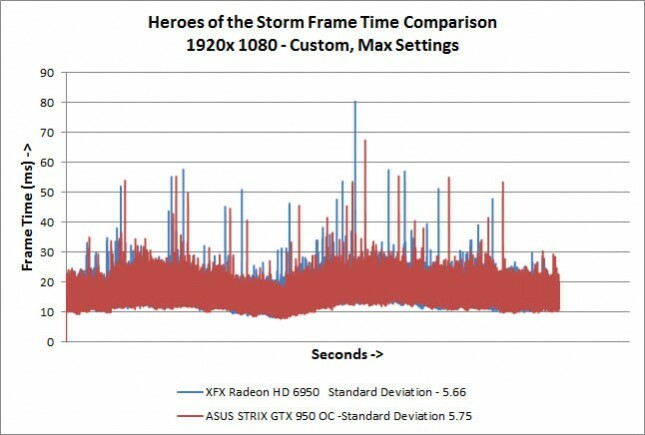 Framerates were above 70 FPS at all times. We see the GTX 950 averaging 69 FPS and the HD 6950 averaging 67 FPS. 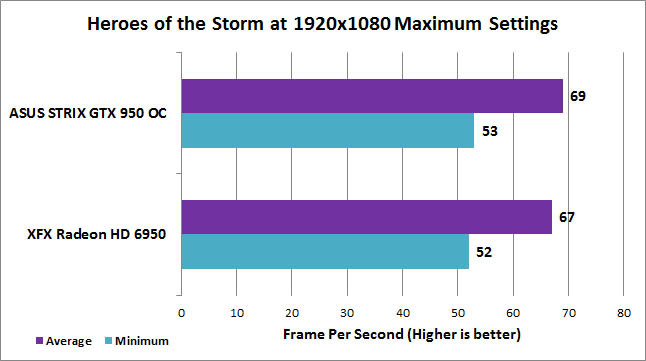 CPU bottlenecking is likely occurring. Benchmark Results: Frame times for both the Radeon HD 6950 and GeForce GTX 950 were close with standard deviation values from the respective video cards coming in at 5.66 and 5.75. We do see spikes past 50ms fairly equally for both cards which could be perceivable as stutter.